Wisconsin Historical Markers: Anishinabe Akhi / "Indian Country"
Anishinabe Akhi / "Indian Country"
The 1849 Ojibwe delegation to Washington, D.C. carried this pictograph depicting Ojibwe clans with their eyes and hearts connected to the chain of wild rice lakes south of Lake Superior. Drawing by Seth Eastman from Henry Schoolcraft's The Indian Tribes of the United States, Vol 1 (1851). State Historical Society of Wisconsin collection. Many native people made their homes in the Chippewa Valley during the 17th and 18th centuries. Dakota (Sioux), Ho-Chunk (Winnebago), Fox, Sauk, Ottawa, Potawatomi, Huron, Tionontati, Menominee and Ojibwe (Chippewa) families used the river system as a water highway for trade and subsistence, harvesting fish, wild rice and other needed resources. During the period 1740 - 1840, the Ojibwe and Dakota dominated the region and contended for the larger share of the fur trade. Competition led to bloodshed. To prevent further warfare and to pave the way for land sales, Americans called a treaty council at Prairie du Chien in 1825. The treaty established the southern boundary of Ojibwe lands, a "half day's march below the Falls of the Chippewa River". By the 1830s, lumbermen and land speculators were lobbying Congress for access to the Northwest Territory. The United States acquired the Chippewa Valley by treaty in 1837. Ojibwe leaders reserved the right to hunt, fish and gather on the land as they had done for generations. Despite the agreement, government officials tried to "remove" Ojibwe families west of the Mississippi. In 1849 and again in 1852, Ojibwe representatives traveled to Washington to protest the removal efforts. President Millard Fillmore confirmed Ojibwe rights in 1852. Two years later a treaty established permanent Ojibwe reservations at Red Cliff, Bad River, Lac Courte Oreilles and Lac du Flambeau. 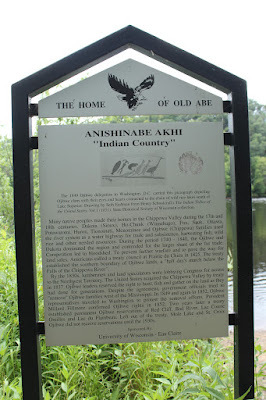 Left out of the treaty, Mole Lake and St. Croix Ojibwe did not receive reservations until the 1930s. The marker is located alongside the Chippewa River State Trail on the western bank of the Chippewa River, and is accessible from southbound 3rd Avenue, south of its intersection with Water Street, near a parking lot for the University of Wisconsin Eau Claire campus, Eau Claire, Wisconsin 54703. NOTE: It's about a quarter-mile walk north from the south end of 3rd Avenue to the marker location along the Chippewa River State Trail. This marker is No. 6 in a series of markers erected by the Eau Claire Landmarks Commission. Looking south along the Chippewa River. take the trail to the right. Park at the south end of 3rd Avenue to access the marker.